SENTigray and SENEthiopia have planned many projects for the upcoming years. The creation of SENTigray will allow our organization to more effectively complete projects as we now have people constantly on the ground in Tigray constantly directing and monitoring progress. The current projects we are working on include Research, improvement of management at the Mekelle Blind School, provision of “Talking Textbooks”, as well as teacher training. We have found that an initial research investigation is essential to the success of our work in Ethiopia. It is imperative that our organization has the correct data on children with special educational needs in the Tigray region. It seems that the existing numbers and data on the topic are estimates and potentially inaccurate. We have designated as our first project the investigation of these existing numbers, to clarify which children have SEN.
We have begun the initial stages of researching children who are already enrolled in schools in the region. Afterwards, we will expand our resources to research those who are not currently enrolled in schools. We are researching where the children are located and what age group they are in, as well as the specifics of their personal special need. This will be a long term project and we anticipate that this will be the greatest stepping stone for our organization as it will lead us to those with greatest needs and to those children who are not receiving adequate education. Project 2: Fence Construction – COMPLETED! We have now completed building a secure fence around the Mekelle School for the Blind. The campus had become an unsafe area as wild animals (hyaenas) wandered in and occasionally attacked the children. 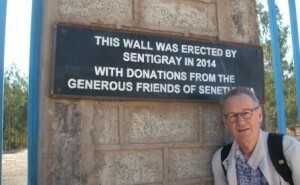 Zewdi GebreGergis, the first director of SENTigray, manged this project through to a successful conclusion; a plaque thanking the donors has been erected on one of the new entrance gateposts. Teacher Training is a project which SENEthiopia has conducted for a couple of years, but we want to continue this work as it has proved to be very effective. The project consists of our organization sending over teacher trainers in SEN and Visual Impairment, training local teachers who must interact with visually impaired students on a daily basis. These training sessions reach outside of the Mekelle Blind School, as they train local teachers from other mainstream schools in the area, which the Blind School students attend. The teacher training has been conducted during several holiday breaks up to 2015, and more are planned. The initial stages of planning have begun in order to assess which teachers would most benefit this year.